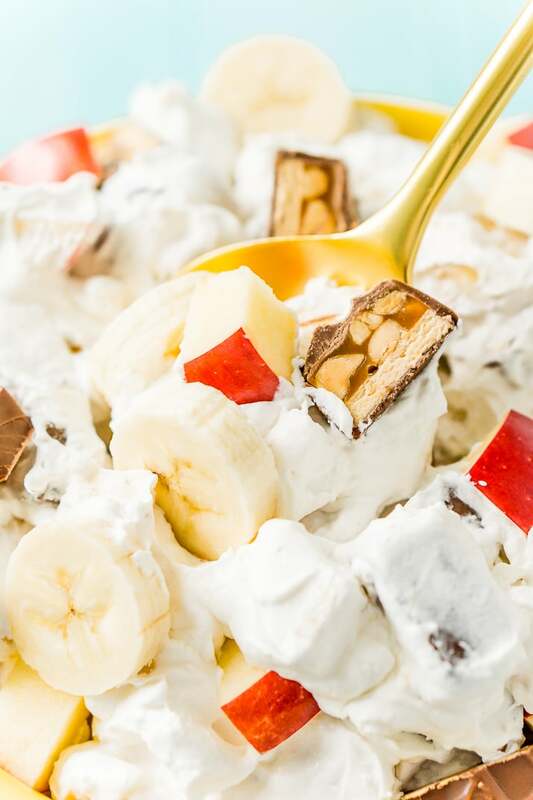 This Snickers Salad is an easy and addictive 4-ingredient no-bake dessert salad made with Snickers, banana, apples, and Cool Whip! 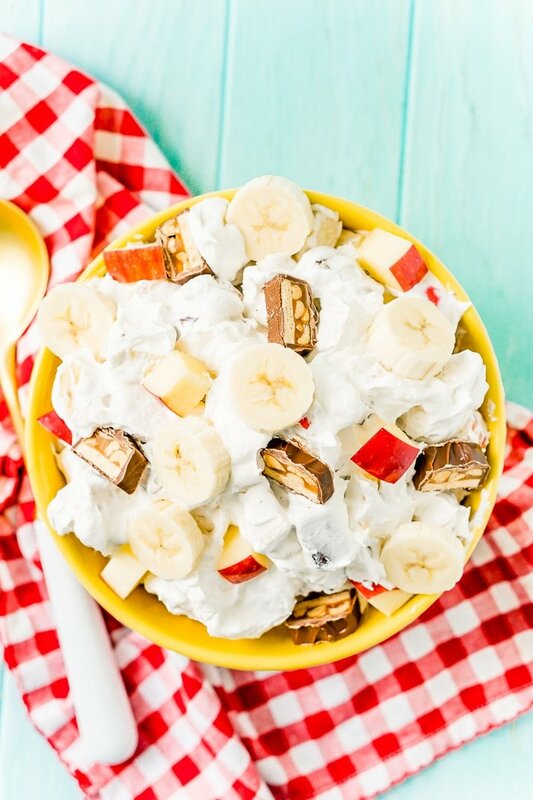 Snickers Salad has been a part of my summer recipe lineup since high school. This is a recipe I got from a friend and we made it a lot during those early summers by the lake, and although we aren’t part of each other’s lives anymore, this delicious 4-ingredient recipe is one I still make often. This is probably my favorite dessert salad, I love that it’s so easy to make and it’s ready to serve immediately, no need for chilling beforehand, although, you will want to keep it refrigerated if you don’t plan on enjoying it right away. 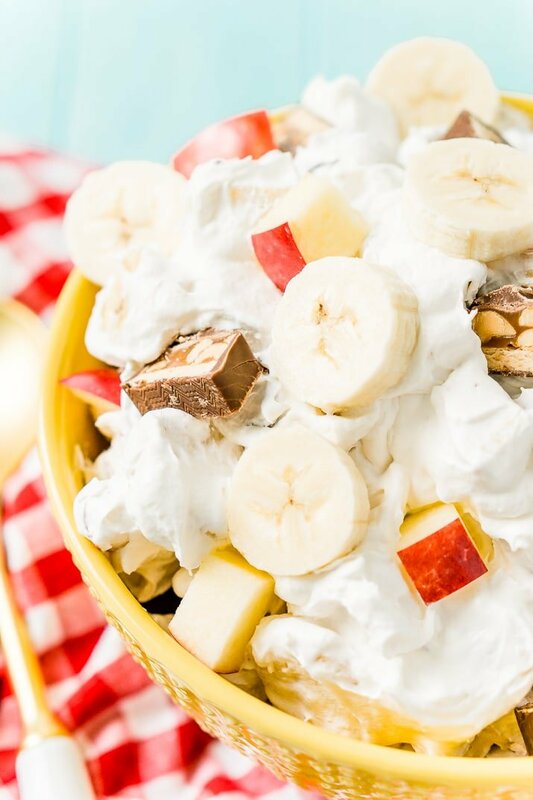 There are a lot of variations on Snickers Salad, but this one if my favorite, you won’t find any cream cheese or pudding in it and this one includes bananas, an absolute must in my opinion. We always called this Three, Three, & Three growing up because the original recipe calls for three bananas, apples, and Snickers bars. It also includes a tub of Cool Whip, so it probably should have been called Three, Three, Three, & One… but that didn’t roll off the tongue as well. Nowadays, I make it with six Snickers bars because, well, Snickers! 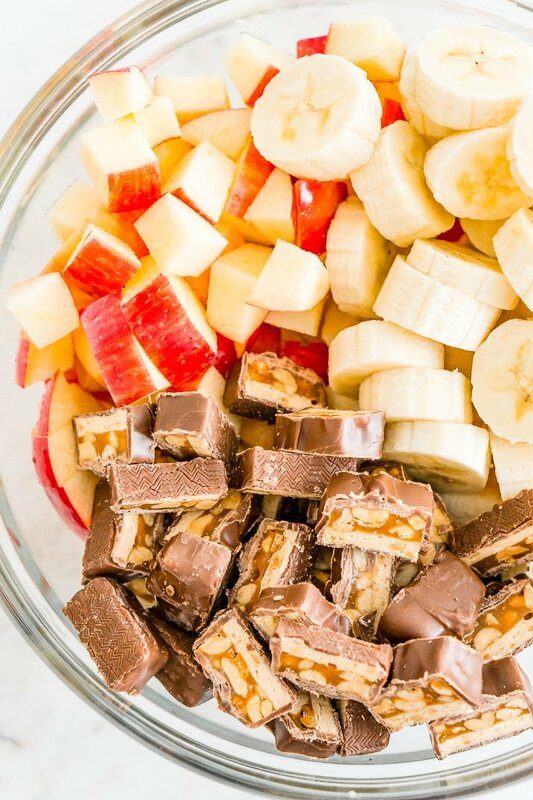 This Snickers Salad is a great recipe for the kids to help make, the bananas can easily be cut with a butter knife and it’s not an overly pretty dish which means they can mix everything together and it doesn’t matter what the end result looks like. This dish is perfect for summer BBQs or even to make up and keep in the fridge for a simple summertime dessert. 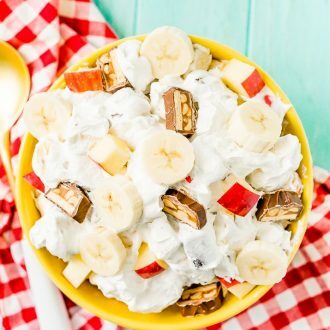 Everyone will love the creamy cool whip loaded up with crisp apples, tender bananas, and the chocolaty caramel nuttiness of Snickers candy bars! Can Snickers Salad Be Made The Night Before? Yes, while you can make it and serve it immediately, you can definitely make it ahead of time, just store it in the fridge. However, this dish is best served within 24 hours, so don’t make it too far in advance. Any firm apple will work great. I recommend using Gala, Pink Lady, or Granny Smith. 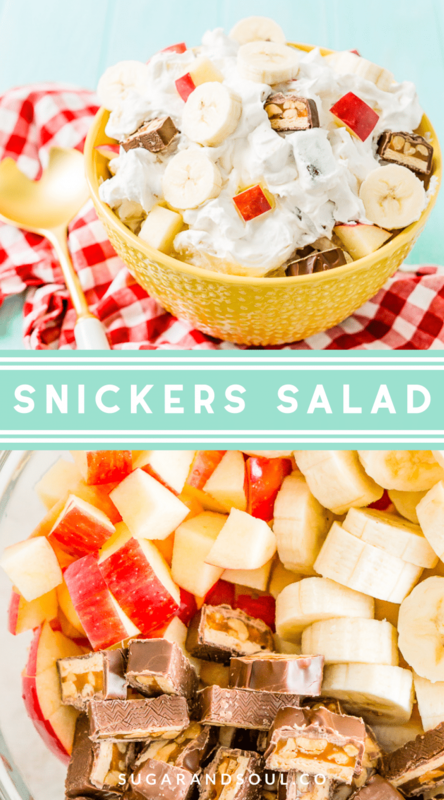 Pin this Snickers Salad for Later! Combine all ingredients together in a large bowl and serve cold.